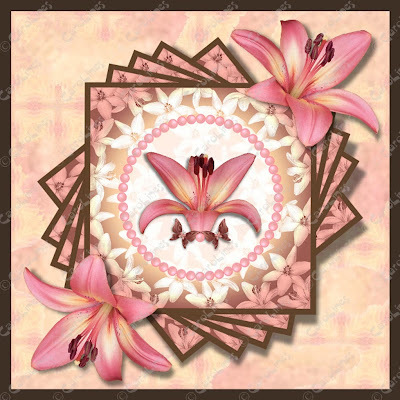 Sample card 7 made using the new Royal Sunset Lily Digital Kit. 1. Create a dark brown square in your graphics programme. 2. Import paper P10, re-size and position inside the brown background. 3. Import topper t4, re-size and position in the centre of the design. 4. Go to transform (if using CAP2) and enter settings: rotation 10.00, copies 5, and X and Y offsets 0.00. 5. Import lily L4 re-size, rotate and position as illustrated partly overlapping one corner of the topper. 6. Copy and paste the lily, flip horizontally and vertically and position over the opposite corner.